How does a camphor balm work? When I was growing up, we had these fascinating red tins in our medicine cabinet. Roughly the size of an average coin, when pried open, these tiny containers exuded a most peculiar scent that you couldn’t get from anything else. Inside was a thick, slightly yellow substance that mum would put on her temples if she had a headache, or used it as a chest rub when I had a cold. Golden Star Balm | Image stolen from this German Ebay listing. 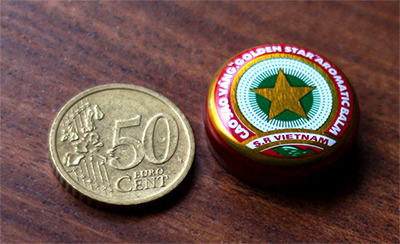 This remedy is known as Golden Star Aromatic Balm, and it comes from Vietnam, where it is known as Cao Sao Vang. Funny enough it was a popular import in the Soviet Union and is still widely used across the region, while almost unheard of in most parts of the Western world. But if you had a whiff, you would instantly recognise it as a cousin of Vicks, or, if you’ve come across it, the Chinese Tiger Balm. They all have several things in common, most notably camphor and menthol, along with peppermint oil. But it is camphor in particular which lends its unmistakeable aroma to these remedies. I find the smell irresistible, so much so that simply sniffing the balm was far more appealing than actually putting it on the skin. Camphor is a natural substance derived from a tree called camphor laurel (Cinnammomum camphora). Distilled from the wood, it is white and has a waxy texture. It belongs to a large class of chemicals known as terpenoids. These compounds are diverse and can be found in all types of living things, but are particularly well recognised in the plant world, where some of them possess strong aromas – think cinnamon, clove, eucalyptus, pine sap. A balm containing camphor can indeed provide “temporary relief” from muscle pains, because the chemical works as a ‘counter-irritant’. It actually causes irritation on the site of application, thus distracting from the pain elsewhere, such as deeper under the skin where the strained muscle resides. The principle of the action is much the same as when you bump your knee into something and rub it to relieve the pain, except with added aromatics and extra stimulation of heat receptors. Menthol and mint oil, two other common ingredients in these types of balms, are also well-known counter-irritants. A combination of all these, plus a few more essential oils, such as cinnamon and clove, can provide a truly effective rub, even if the effects do not last or actually remove the cause of the pain. On top of being a counter-irritant, camphor is also a mild pain reliever (analgesic), although the molecular mechanism for this is not well understood. I haven’t encountered a tin of Golden Star for ages, but today I purchased Tiger Balm, which is produced in Singapore and readily available in Australia. The two remedies share a majority of ingredients, so they share a true likeness in aroma, too. There is something about the smell of camphor that I just find deeply satisfying, so I’m quickly getting into the habit of unscrewing the jar, sniffing it, and putting it away again. Addictive. Once I have a sore muscle somewhere, I’ll probably try it out, too. 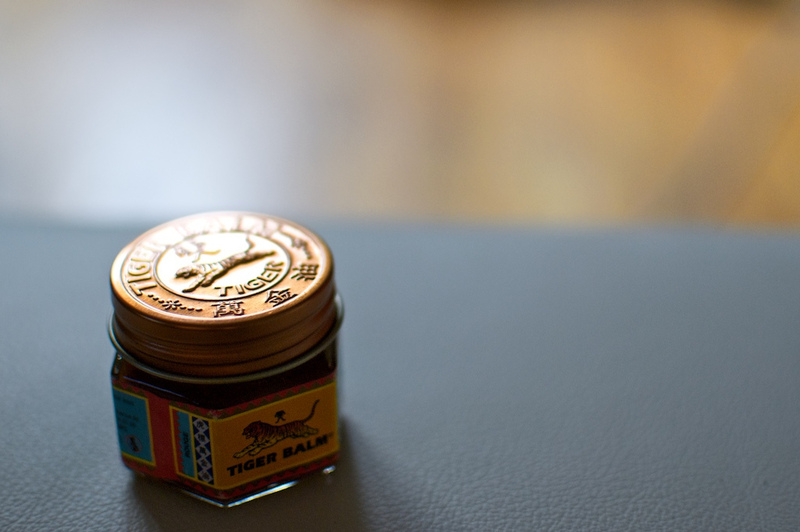 I have noticed this thing is very popular in Southeast Asia, it is mostly called Tiger Balm, but there are also some local varieties in Cambodia and Thailand. I was particularly surprised to discover that this thing from my childhood – “zvaigznīte” as we called it – actually originates in Vietnam.